#17 Merrimack scored a pair of second-period goals within 63 seconds to break a tie and hung on to edge #7/8 BU, 4-3, at Lawler Arena. Goaltending struggles continue for the Terriers as Sean Maguire yielded a goal on the game’s first shot by Brett Seney. Midway through the period, Ben Bahe jammed a shot home to double the lead. BU got on the board early in the second period when junior Robbie Baillargeon and sophomore Brien Diffley got the puck to sophomore John MacLeod (photo) at the right point for a blast that sailed past the Warriors’ Collin Delia. 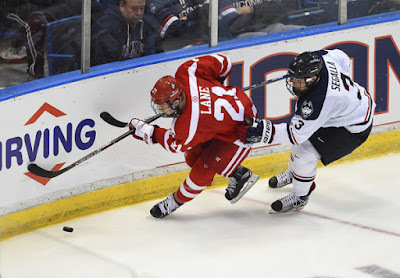 Four minutes later, freshman Ryan Cloonan raced up the right side and head-manned a pass to senior assistant captain Matt Lane whose backhander beat Delia to knot the score at two apiece. Late in the period, however, with the teams skating four-on-four, Merrimack struck twice in 63 seconds with goals from Hampus Gustafsson and Ethan Spaxman. 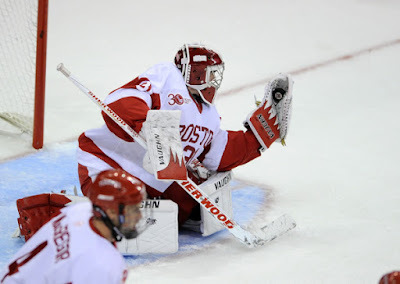 Quinn replaced Maguire in goal with Connor LaCouvee as BU tried to engineer a second comeback. Early in the third, the rebound of an Ahti Oksanen shot skittered out to the top of the left circle where sophomore Brandon Hickey one-timed the puck home to cut the lead to one. The Terriers pressed throughout the period, out-shooting their hosts, 14-8, but couldn’t produce an equalizer. Just as in Tuesday’s loss to UConn, BU outshot its opponent, 37-26. 2017 recruit David Farrance scored a power play goal and added a primary assist on the game-winner for Team USA, which defeated Canada Red in an exhibition game for the World U17 Challenge in Dawson Creek, British Columbia. 2018 recruit Logan Cockerill also assisted on the game-winner. 2016 recruit Kieffer Bellows’ shoot-out goal was the game-winner in the NTDP U18s’ 3-2 win over the Chicago Steel. Bellows had a goal waived off in the final minute of regulation when the goalie dislodged the net. #14 Terriers travel to New Hampshire on Sunday for a 2p.m. match-up with the Wildcats. #7/8 Terriers continue Hockey East play tonight, visiting #17 Merrimack at Lawler Arena in North Andover, Mass. Puck drop is at 7 p.m. with a paid Webcast available from Merrimack Athletics.tv. The Warriors bring a 2-0-2 record into the contest after a pair of ties last weekend with UMass Lowell. BU is 26-9-5 (.713) in 40 previous meetings at Lawler Arena. Merrimack’s top returning scorers are sophomore Brett Seney and junior Hampus Gustafsson. Sophomore Collin Delia has taken over between the pipes after playing nine games last season. The 2-2-0 Terriers’ offense is led by senior assistant captain Danny O’Regan (1G, 4A), freshman Ryan Cloonan (2G, 3A) and sophomore Brandon Fortunato (2G, 2A). Coach David Quinn has tweaked his top two lines again, putting freshman Jakob Forsbacka-Karlsson between O’Regan and senior Ahti Oksanen, while Cloonan will play the off-wing with assistant captain Matt Lane and freshman Jordan Greenway. Senior Sean Maguire gets the start in goal. 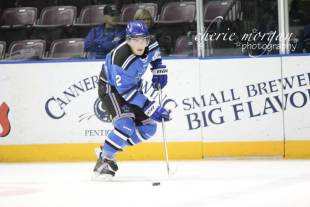 2016 recruit Dante Fabbro discusses his decision to commit to BU with the Penticton Western News. 2017 recruits David Farrance and Brady Tkachuk and 2018 recruit Logan Cockerill are on the Team USA roster for the 2015 World U17 Challenge beginning Monday in Dawson Creek and Fort St. John, British Columbia. After an exhibition game tonight against Canada Red, Team USA begins the tournament with a game against the Czech Republic. The Devils took on the Flyers last night in a game with college connections, as NJ Coach John Hynes is a former Terrier skater and graduate assistant and the Flyers coach, Dave Hakstol spent 11 seasons leading the University of North Dakota. The Devils came away with a 4-1, the team’s 100th victory over Philadelphia. Episode 4 of Inside BU Hockey features Bernie Corbett’s interviews with Terrier Head Coach David Quinn, freshman forward Ryan Cloonan (photo) and first-year assistant coach Scott Young. A speedy winger from East Longmeadow, Massachusetts, Cloonan joined BU after scoring 65 (20G, 45A) points in 50 games with the Junior Bruins last season and tied for the USPHL lead in power play points with 21. A 17 year NHL veteran who won the Stanley Cup twice, Young moved up to the coaching staff after serving as Director of Hockey Operations last year. Previously he was head coach at his alma mater, St. Mark’s School for four seasons. ►The Boston Hockey Blog tweeted that Quinn will make further line-up changes, moving Jakob Forsbacka Karlsson (photo) to first-line center between Danny O’Regan and Ahti Oksanen, while Matt Lane will center Cloonan and Jordan Greenway. For Friday’s game at Merrimack, Brien Diffley will return to the defense rotation and Sean Maguire will start in goal. Friday’s USHL game between the NTDP U18s and the Chicago Steel will be live-streamed for free on FastHockey.. Game time is 7 p.m. ET. The U18s roster includes 2016 recruits Kieffer Bellows, Clayton Keller, Chad Krys and Jake Oettinger. Colby College has announced a $2 million endowment for naming its Head Men’s Hockey Coach position for Jack Kelley. 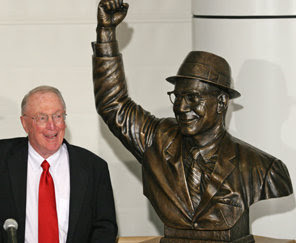 Before spending ten highly successful years at the Terriers’ helm, Kelley turned Colby into a New England powerhouse posting an 89-51-5 record and earning NCAA Coach of the Year honors in 1962, the first “small college” coach so honored. Stepping behind the bench of his alma mater in 1962, Kelley’s BU teams won six Beanpot titles, one ECAC title and two NCAA titles en route to a 206-80-8 record and a .720 winning percentage. After coaching and being a general manger with the New England Whalers, Kelley returned to Colby for a final season in 1976-77 and recorded his 300th college win. ►This week's Terriers in the NHL update features video of goals scored by Colin Wilson, Jack Eichel, Charlie Coyle and Nick Bonino. Coach Brian Durocher has also done some shuffling with his top two lines and it paid off in last Saturday’s 5-2 win against Vermont. Next up for BU is a Sunday matinee in Durham against New Hampshire. Dutchmen send undisciplined BU home empty-handed.